Since 2011, Paul Feig has made a name for himself in the comedy genre. His films tended to be critical and financial success, even his attempt at Ghosbusters proved modest despite naysayers. The problem with his films is that they’re entirely interchangeable. They all follow the same brand of humor, they each have similar characters and he just comes off as a one-trick pony. However, that seems to have changed with A Simple Favor, his interpretation of the novel of the same name. With this film, it seems he has finally found a way to break out of the rut he was in. The story for A Simple Favor unoriginal but nevertheless engaging, clever and at times shocking. The story follows Stephanie Smothers, a single mother who runs a vlog and volunteers for every event at her son’s school. Her simple yet hectic life is thrown for a loop when her son befriends the child of Emily Nelson and a friendship between the two quickly blossoms. The first twenty minutes of the story are very enjoyable as it’s simply just Stephanie and Emily hanging out but in this time though a slow burn we learn more and more about our main characters and how truly mysterious and messed up they are. In this first act alone the story throws some absolutely shocking curve balls and does so in a creative way: The two lie to one another but in their silent flashbacks we see the truth. It isn’t long before Emily goes missing and this is the where the unoriginal. There’s a massive media blitz over her disappearance, suspicion falls on Stephanie and Emily’s husband Sean and the mystery of what happened to Emily slowly but surely unravels. If this sounds familiar it should it’s roughly the same exact story as the Gillian Flynn novel Gone Girl and it’s theatrical interpretation. The main plot is similar note for note which at times makes the story rather predictable. That being said A Simple Favor is still it’s own animal and that is largely due to Feig himself. For once he’s made something that feels completely different, something that doesn’t feel like a Paul Feig movie. His approach to Neo-Noir is done very well as he manages to keep the pace flowing nicely and never drags his feet. He also manages to incorporate a lot of dark humor which is very effective and memorable. What’s more it fits perfectly in with the tone of the film so much so that humor not only feels natural but gives a rather pleasant surreal feeling to the whole film. Are we meant to see this more as a dark comedy or are we supposed to take everything seriously in the strangest way? It really is amazing. Of course the story ends up where we all know it will but even so the ride to the end is shocking, intriguing and quite hilarious at times. Stephanie a fine main character. She’s very energetic and friendly but even so even she manages to have some completely surprising aspects to her character. Through the course of the mystery she beings a relationship with Sean and even begins to grow accustomed to the idea of living like Emily. This certainly adds to the mystery and adds a nice flawed level to her character. Even so she still remains a pleasant character throughout. Emily is an interesting character, a mystery wrapped in an enigma with a caramel center. Early on she is darkly humorous and enjoyable but of course everything is not what it seems and as the film unfolds we see who the real Emily is and the real Emily is a messed up character. Anna Kendrick is incredibly delightful as Stephanie. Kendrick brings her usual energetic, bubbly and over the top self to her performance. She’s incredibly humorous and entertaining and the moments where she acts flustered come off as very genuine. Blake Lively is entertaining as Emily. Lively is deliciously insidious and intimidating, taking sheer delight in how wicked her character is. She works incredibly well with Kendrick and the two have excellent chemistry which makes for some absolutely great moments through the film. The supporting cast is also incredibly enjoyable. Henry Golding does fine as Sean coming off as memorable and having decent chemistry with Kendrick. Joshua Satine and Ian Ho are incredibly entertaining and funny as Miles Smothers and Nicky Townsend-Nelson I would go as far as to say theirs was the standout performances in the film. Rupert Friend gives a brief but delightfully sleazy performance as fashion mogul Dennis Nylon. Andrew Rannells and Kelly McCormack are both hilarious as Stephanie’s friends Darren and Stacy. Like so many others their roles are brief but immensely enjoyable and memorable adding more to the comedic aspect of the film in the best of ways. 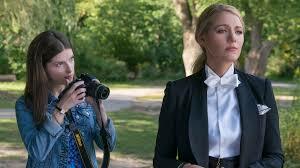 Final Thoughts: A Simple Favor doesn’t win points for originality but is still a fantastic movie. The story does have some excellent moments and well made twists, the genre blending of neo-noir and dark comedy is perfect, the characters are strong and the acting is wonderful. To me it’s Feig’s best film to date and perhaps the biggest surprise of the fall. Good day to you, my name is Jonathan Gonzalez. For years I've loved movies and have been reviewing them for years, ever since I first saw Roger Ebert on Ebert and Roeper during my freshman year of high school for the first time. I am a graduate of Mercy College with a Bachelor's in Journalism and I have Asperger's Syndrome, something I am truly proud of.